Pat Wagner, l., with Marian Brickel. 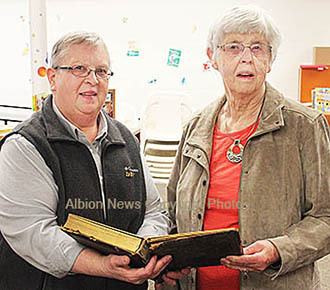 A treasured 100-year-old photo album, with labeled and dated family photos of early ancestors, was united with current family members during the Boone-Nance County Genealogical Society meeting in Albion on Monday, April 11. William Campbell of Pueblo, CO had emailed the Albion News asking about members of the Houtz family, and the newspaper notified the genealogical society. 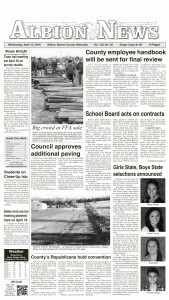 Pat Wagner, a society member, contacted Marian Brickel, who is a granddaughter of Frank Houtz. Marian (above, right) attended the meeting on April 11 and was given the family photo album by Patricia Wagner, society president.